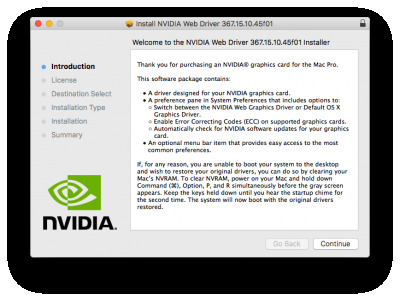 NVIDIA has released alternate graphics drivers for macOS Sierra 10.12.6. These are separate from the drivers Apple ships as standard, and should be considered experimental. These drivers have been known to solve OpenCL issues with certain applications, as well as providing better native GPU power management for certain devices. NOTE: These drivers are currently the only method to get full acceleration for GeForce GTX 1050, 1050 Ti, 1060, 1070, 1080, 1080 Ti, TITAN Pascal, and TITAN Xp 'Pascal' graphics cards and NVIDIA GeForce GTX 750, 750 Ti, 950, 960, 970, 980, 980 Ti, and TITAN X 'Maxwell' graphics cards. There are no current Macs with these cards, so support is absent natively in macOS. Method to use old drivers here. There's a new method for enabling the NVIDIA Web Drivers in the latest versions of Clover. It can be turned on and off by editing /Volumes/EFI/EFI/CLOVER/config.plist to add SystemParameters/NvidiaWeb. This takes the place of nvda_drv=1 boot flag, which will not work in macOS Sierra. I just came here to say that this update installed this morning has fixed a load of problems I was having on my recent build - GTX1080 Sierra Asus Maxiumus IX 7700K o/c 4.5GHz 64Gb. I was having problems with my 3 screens not being detected at initial boot, black screens and Xcode not displaying 3D assets in the SceneKit editor - now they all seem to be working! outstanding! Hold off on this update for now if you use the Adobe apps. The accompanying CUDA update is not out yet. Photoshop doesn't use CUDA much, Premiere and After Effects do though. Great to know, also great to tell everyone, perhaps this should be in the original post? Well, if you don't want to wait for CUDA driver, you can modify 10.12.5 webdriver and reinstall it. Also do the NVStartup modify trick as well.